550 light years from here is a star very much like our own, except that it has a strange habit of blinking out at irregular intervals. 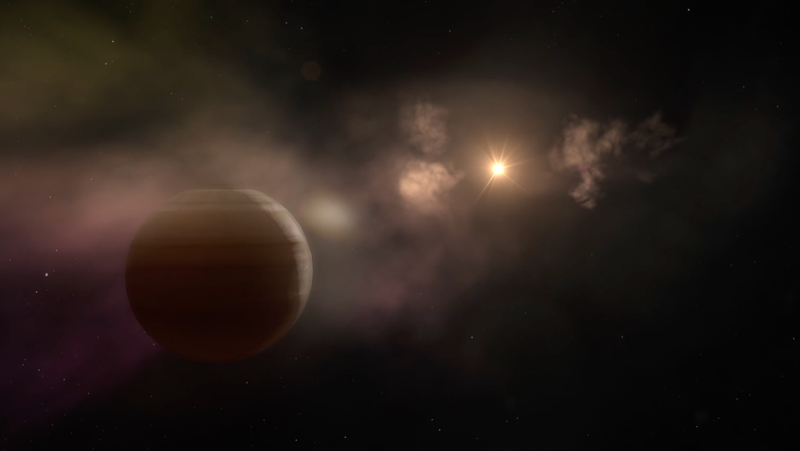 This erratic dimming, according to a new study, could be caused by clumps of orbiting gas and dust—the possible remnants of a planetary catastrophe. The star is called RZ Piscium, and its odd dimming periods can last upwards of two days. At times, the object’s luminosity drops 10-fold, which is significant. A considerable amount of infrared radiation is spewing out from RZ Piscium, which to astronomers signals enormous quantities of dust. So no big deal, right? We’ve seen this sort of thing before in the form of protoplanetary disks encircling infant stars. This nascent, dense asteroid belt could be producing copious amounts of dust and gas. Or if not this explanation, perhaps RZ Piscium is really, really old and it’s now entering into its death phase; as the star gets increasingly larger, it’s annihilating all nearby planets, creating the observed gas and dust. The trouble with all these theories, however, is that they don’t jibe with the age of the star. New research published in the Astronomical Journal suggests RZ Piscium is too old to host a protoplanetary disc, and it’s not old enough to enter into a red giant stage. Something else must be going on. To determine the age of the star, a research team from the Rochester Institute of Technology and the University of California, Los Angeles measured its X-ray output using the XMM-Newton space observatory. The observed X-rays were spewing out at rate a thousand times greater than what our Sun can produce. RZ Piscium’s surface temperature was measured at 5,330 degrees C (9,600 degrees F), which is only slightly cooler than the Sun. Both of these factors are strong indicators of youth. What’s more, RZ Piscium is also packed with lithium. Importantly, most Sun-like stars lose their protoplanetary disks within a few million years. “The fact that RZ Piscium hosts so much gas and dust after tens of millions of years means it’s probably destroying, rather than building, planets,” added team member Ben Zuckerman, of the University of California, Los Angeles. Further observations from the ground placed the temperature of the gas and dust at around 230 degrees C (450 degrees F), which means this material is in relatively close orbit around the star—about 30 million miles (50 million km), or about the distance between Mercury and the Sun. Also, this material isn’t being pulled in any one direction; the dust and gas is both falling towards the star and flowing away. So whatever transpired here occurred in the recent past—the whole situation is just too... chaotic. Or the planetary destruction is still happening. The best explanation, say the researchers, is that this debris is the remnant of a planetary catastrophe. But even then, there are multiple scenarios. Punzi said her own personal suspicion is that we’re seeing the destruction of a hot, Jupiter-like object, because of the evidence of gas and dust orbiting RZ Piscium. So clearly we don’t yet know the exact story, but it seems astronomers are getting closer to the answer. RZ Piscium is suddenly a very fascinating star to study.